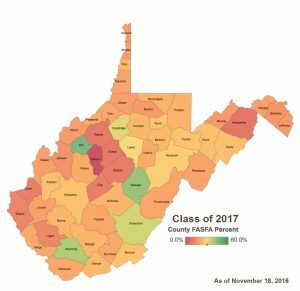 CHARLESTON, W.Va. – The College Foundation of West Virginia (CFWV) today announced a goal to increase the number of 12th graders who complete the Free Application for Federal Student Aid, or “FAFSA,” to 60 percent by April 15. Students planning to attend college during the 2017-18 academic year can complete the FAFSA online now at www.fafsa.gov using their 2015 tax returns. April 15 is the deadline for students to submit the form and be considered for the West Virginia Higher Education Grant Program, which provides grants to students based on their financial need. A complete list of FAFSA completion rates for the class of 2017 by county and high school is available at www.cfwvconnect.com/financial-aid-outreach. The list will be updated weekly as schools make progress toward the goal. According to a report from the White House, “The President’s Plan for Early Financial Aid,” an estimated 2 million students who are enrolled in college and would be eligible for federal grants are missing out on receiving financial assistance because they failed to apply. To help more students complete the process, the federal government made changes this year to give families more time and make applying easier. In past years, the FAFSA opened online on January 1, and students had to submit information from their immediate prior year’s tax returns. This year, the form opened on October 1, and students can use their tax returns from 2015 instead of having to complete their 2016 returns first. Dr. Sarah Tucker, Chancellor of the West Virginia Community and Technical College System (WVCTCS), said completing the FAFSA is one of the most important steps in preparing for college. “By completing this one form, students can be considered to receive thousands of dollars in grants from both the state and federal government — that’s ‘free money’ that you don’t have to pay back,” Dr. Tucker said. Filing the FAFSA allows students to be considered for the Federal Pell Grant, which next year will provide students with up to $5,920 to cover the cost of tuition and other education expenses. Students who file the form before April 15 also will be considered for up to $2,700 through the West Virginia Higher Education Grant Program. Additionally, completing the FAFSA is a requirement of applying for State scholarship programs, including the PROMISE Scholarship. More information about these programs and other financial aid opportunities is available at cfwv.com, the state’s free college-planning website. College and university partners across the state have been working with high school counselors to increase awareness of the FAFSA and help students and families complete the form. For example, staff from the Commission’s office of financial aid are working together with financial aid staff at colleges and universities to offer hundreds of free financial aid and FAFSA workshops. A complete list of upcoming workshops is available at http://cfwvconnect.com/community-calendar . CFWV is a college- and career-planning outreach initiative led by the Commission in collaboration with WVCTCS, the West Virginia Department of Education and the West Virginia Department of Education and the Arts.